The institution is run like living in a big family, but after all, is not independent of the organizational and administrative rules and regulations. Usually during the day to live up to four hundred girls, nearly one hundred and forty people serving in different shifts which needs close empathy. 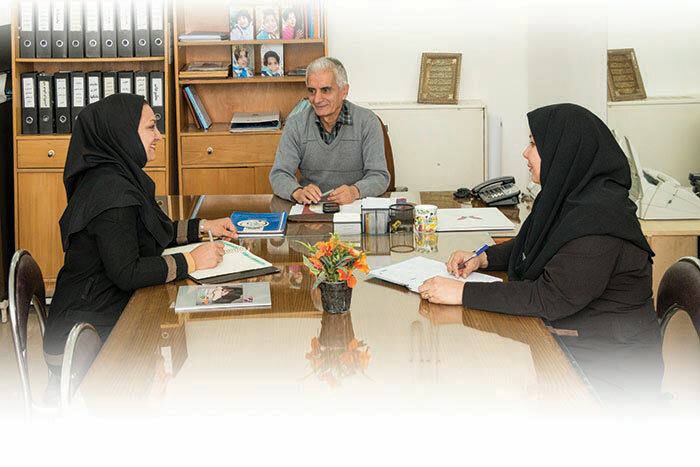 Human Resource, General and Administrative Affairs are run by Mr. Mahmoud Kamardinzadeh and his colleagues. He, whose hair became white in welfare organization and is a retired executive manager, joined our center in 2006 after Hamdam was run by board of trustees and he was appointed as the human resource manager. MrKamardinzadeh pointed that, “In the early days of young hood, after teaching in villages for a while and at the time I applied for education in foreign universities, I accidentally saw a job advertisement which talked about supporting the orphaned families and it changed my life and from that day I was drawn to an organization which was later called Welfare Organization”. He worked for 30 years in different sections such as social work and administration affairs and the most recent as the head of personnel department in Khorasan Welfare Organization. Please describe the Human Resources section for us. In this unit, organizing human resources for the improvement of the institute is done and usually people are invited based on different needs. As I have been here since 2006, we tried to do all our activities and employment according to law and all the employments were based on labor law. Those who apply for a job, no matter how they find out about it, first complete an application form and then based on their expertise they are introduced to different sections. Of course, they spend some time in the institute to be familiar with the conditions and see whether they are suitable for the job or not. Although we try to use skillful workforce, difference between university education and the reality of the society leads us to have in-service training for the staff to have a better relationship with the children. Before managing the system by Board of Trustees, when the institute was run by employees of Welfare Organization, the situation was different and there were 176 clients and 240 employees. But now because of special condition with 400 clients we are obliged to use fewer workforce which needs more support and empathy. Are there any specific programs to support the employees? As we are like a family, one of the concerns of the board of directors in this institute has always been the employees’ well-being and we have always used every opportunity to support the employees such as paying loans with the help of some banks, sending them to touristic and pilgrimage trips, giving them goods, … . But what is important to pay attention is that there is no specific budget for these activities and people’s donation is for children and we are not allowed to use it for other activities. However, paying attention to the staff who are working hard for the children’s rehabilitation is an important issue and increases their motivation and eagerness, so the need for a welfare committee for the staff is really necessary and we hope we will have it in the near future. Any memories during these years? My best memories during these 38 years of work belong to the last 8 years in this institute. Every morning with an indescribable passion coming to work and I have always asked God to end my service while I am at work and like trees, die standing. During all these years my wife and family supported me and I use this opportunity to thank them, they are all sharing in my service. I hope the young who are looking for job, starting their lives, choosing their course of study and their way of life have enough motivation to do so, since each activity with eagerness and passion is really successful and effective. I thank and say goodbye to MrKamardinzadeh to go and talk to his colleagues. I hope he serves many years for Hamdam girls and stay happy and healthy. Ms. MahnazSepahi, who joined our colleagues in 2010, is responsible for this section. She talks about how she became familiar with this institute: One day I was passing this street. I went inside and became interested in working here. Although I was an expert in law, because of my interest I filled in an application form. They called me after a few days and this was how I joined Hamdam girls. Her first two years were started as a trainer and then worked in the public participation department and finally she was appointed as the Public Affairs manager. Coordination between different units, salaries, insurance, extra work hours and other relevant matters regarding the staff and shifts are part of her responsibilities. Furthermore, coordination with municipality and other organizations such as police, traffic organization, fire department, internal issues of the institute like green areas, asphalt and etc are matters that she follows patiently. Ms. Sepahi, who always has a smile on her face says: Once for the following up of one of the center’s activities I went to the relevant organization which had to be done earlier but it wasn’t. When I entered the room of the related guy, he just said when we wanted something free we had to run for it. What he told me was too heavy for me but I told him in a relaxed way that if it was for my own benefit what you said was right, but now it was the orphaned girls. However, people are very good, and after God, they support Hamdamgirls. How can people help your department? Although here's women’s environment, but kindly gentlemen can always be very efficient here, sometimes we need painting, welding, or individuals for the construction work and services. We need people who can maintenance work or those who have a minibus or a pick-up truck is a help. Some time ago a respected driver with the pickup truck brought the kids some food and later announced that he wants to be an honorary fellow. Or a friend who is an electric engineer told us he would be ready to spend two days a month for the institute. Totally, 30 or 40 male people are helping us and 10 of them have an effective presence which we are thankful. I remember one month after my presence her my father passed away. At the moment I found out about it I was at work. I ran home and then I experienced terrible days. But the first place I told my family to take me was the institute. I was relieved besides these girls. Since I have worked here most of my life has been blessed and I feel it with all my soul. Working here involves good and bad days, however we are a family. During all these years my husband has been my friend and companion which I want to thank him for his kindness. Between our conversations, Roghayeh (one of Hamdam girls) entered the room with a letter in her hand. Ms. Sepahi pointed out that Roghayeh is one of their colleagues in the office and the girls here are helping in the tasks of their house. Roghayeh with nice smile on her face said that all the colleagues there are her father and mother and love them very much. Sometimes these small papers which you see goes from one hand to another have influential impacts that might seem worthless. Ms. ToktamSadeghi, who started working here in 2011, is the person in charge of this unit. Initially she started her duty in public relations and then after a few years because of her thoroughness she was appointed as the person in charge of the secretariat. Ms. Sadeghi said, “Getting started in this area had its own problems and it took a while our friends realized the importance of their relationship with this part of the institute but I thank God right now since reports and correspondence have changed for the better. Here all the incoming and outgoing letters are registered and besides typing, the invitations and other letters are prepared and sent”. Ms. Sadeghistill continues her cooperation with public relations in registering the donator’s information. You do not have direct contact with children. Doesn’t it frustrate you? As you know, our duty needs full time attention to administrative matters and to tell you the truth, yes I miss them especially since I am a mother myself. Sometimes when we need something from the neighboring building I ask one of the girls to bring it so I find a short moment to greet her. Or when the girls walk past the room and say hello we get a lot of energy and feel more powerful. I, like other colleagues, feel happy when I see their happy faces. I remember the day one of the girls got her books to go to school, she walked past in front of me and it made me really happy. Or when I see Shahrbanoo doing her rehabilitation activities, despite her high disability, with a smile on her face, makes me happy. I use this opportunity to thank my family and my husband for their companion. To tell you the truth, my idea and the way of my life has changed since I started working here. I thank all the colleagues in this department and I hope we set forward the service in humane way together. Every day with fewer mistakes and more positive effects as this is the definition of family and all, authorities, colleagues and clients, side by side with empathy and mutual respect experience the blessing days.